Tomihisa Taue was elected mayor of Nagasaki in 2007 and began his third term in April. He is vice president of the international organization Mayors for Peace. Taue spoke by telephone with Arms Control Today from his office on June 15. In the conversation, which was conducted through an interpreter, he spoke about the possibility of a visit by U.S. President Barack Obama to Nagasaki, the concept of a Northeast Asian nuclear-weapon-free zone, and the need for the world to know and remember the facts of the Hiroshima and Nagasaki bombings. The interview was transcribed by Nathaniel Sans. It has been edited for clarity. ACT: Thank you very much for doing this interview, Mr. Mayor. When you spoke before the 2015 Nuclear Nonproliferation Treaty [NPT] Review Conference on May 1, you noted that the average age of the survivors of the atomic bombings of August 6 and August 9, 1945, is 80 years. You said that “we have a responsibility to show these survivors the path to the abolition of nuclear weapons while they are alive to witness it.” As the vice president of Mayors for Peace and the mayor of Nagasaki, what specific steps do you think are necessary in the near term to put the world on the path to the abolition of nuclear weapons? Taue: During the NPT review conference, we were not able to bridge the gaps between the nuclear-weapon states, who insisted on a step-by-step approach, and the non-nuclear-weapon states, who insisted on a comprehensive approach. We need to continue with the dialogue in order to fill in this gap. ACT: Are there specific mechanisms that are needed? For example, you have referred in the past to creating a new and continuing conference that would be open to all countries. Is that something that should be pursued? Taue: Yes, I think that these conferences will be needed. When I visited Washington this May and met with officials of the U.S. government, I made a proposal. For example, we should set up a working group at the UN General Assembly to consider effective measures to fill in the legal gap in order to ban and eliminate nuclear weapons. ACT: And what was the response? How did they receive the proposal? Taue: I’m not allowed to disclose details of the discussion. However, the U.S. officials said that they would like to make every effort to adopt a final document at the NPT review conference. They were inclined to work something out at the NPT review conference to advance nuclear disarmament. Regrettably, we were not able to reach a final agreement, but they were determined to bring the conference to a successful conclusion. ACT: At the review conference and since then, do you believe the key states have shown the necessary commitment to the abolition of nuclear weapons and established a path toward that goal? Taue: By “the key states,” do you mean the nuclear-weapon states? ACT: Right, the nuclear-weapon states and other states that would be part of the effort to push them, but primarily the nuclear-weapon states. Taue: When the first proposal for the final document was reported, it was a good one. However, after the second and the third drafts had been submitted, I think the countries went a little backward. As the draft was updated, the contents were degraded. I believe that one of the reasons for this is that the nuclear-weapon states insisted on a step-by-step approach and that, as a result, the final document draft has been degraded. I think that the nuclear-weapon states need to have in mind that we need to speed up nuclear disarmament as a whole. ACT: So, the step-by-step approach is not sufficient, in your view? Taue: I do not believe that the step-by-step approach is insufficient. However, there is a reality that while we were not able to proceed with the step-by-step approach, other states have obtained nuclear weapons. There is also an emerging danger that terrorists might obtain a nuclear weapon. The step-by-step approach and a comprehensive approach do not contradict each other. We can proceed with them in parallel. ACT: In his address to the NPT review conference, Japanese Foreign Minister Fumio Kishida invited world leaders to visit Hiroshima and Nagasaki when they gather in Japan for the Group of Seven summit in 2016. Why would a visit to Japan by President Obama and other world leaders be meaningful to the people of Japan, and how could such a gathering be designed to catalyze action by these leaders on the next steps on nuclear disarmament? Taue: Foreign Minister Kishida is originally from Hiroshima, so he has a strong passion for his hometown. We have continually appealed for world leaders to visit Hiroshima and Nagasaki because I believe that when we discuss nuclear weapons issues, it is important to know the facts about what the use of nuclear weapons will bring about. So, with an open mind, we should first know the facts before we go into this discussion. So, I think it is important for the leaders to know what happened under those mushroom clouds. When I met with the U.S. government officials last month, I also made a request for the president to visit Hiroshima and Nagasaki. The reason for this is that if the U.S. president visits these atomic bomb cities, the other leaders will likely follow. The second reason is that we would like to have President Obama convey a message to the world that Nagasaki should be the last site on earth to suffer from nuclear devastation. I think that this message will be a very strong appeal to the world in continuance with the speech he made in Prague. Third, this will be a productive collaboration by President Obama and the city of Nagasaki toward nuclear abolition, which would be a great honor for us. ACT: Are there specific steps that Japan and other middle powers, including the other members of the Non-Proliferation and Disarmament Initiative, can take to spur multilateral progress on nuclear disarmament? What steps can the government of Japan take to accelerate progress toward nuclear disarmament and reduce its own reliance and other states’ reliance on nuclear deterrence? Taue: The steps that Japan could take are to establish a security policy that does not rely on nuclear deterrence, promote trust building in the region, and establish a Northeast Asian nuclear-weapon-free zone in the region. To be precise, three states—Japan, South Korea, and North Korea—should establish a nuclear-weapon-free zone, and the neighboring nuclear-weapon states—that is, the United States, Russia, and China—will not use or threaten to use nuclear weapons, and they should guarantee this. This idea of a comprehensive security arrangement in Northeast Asia is something that the Japanese government could implement. And this March, the Nagasaki University Research Center for Nuclear Weapons Abolition has made a proposal of a concrete, comprehensive approach toward a Northeast Asian nuclear-weapon-free zone. This has been done with the assistance of Dr. Morton H. Halperin, and I think that their proposal is something that should be considered. ACT: So, under this proposal, Japan would no longer rely on the so-called nuclear umbrella of the United States? Is that correct? Taue: Yes, exactly. We will not be relying on a nuclear umbrella, but spreading a non-nuclear umbrella for the region. ACT: In August, the people of Nagasaki and people around the world will mark the 70th anniversary of the bombing that caused some 150,000 casualties in your city. 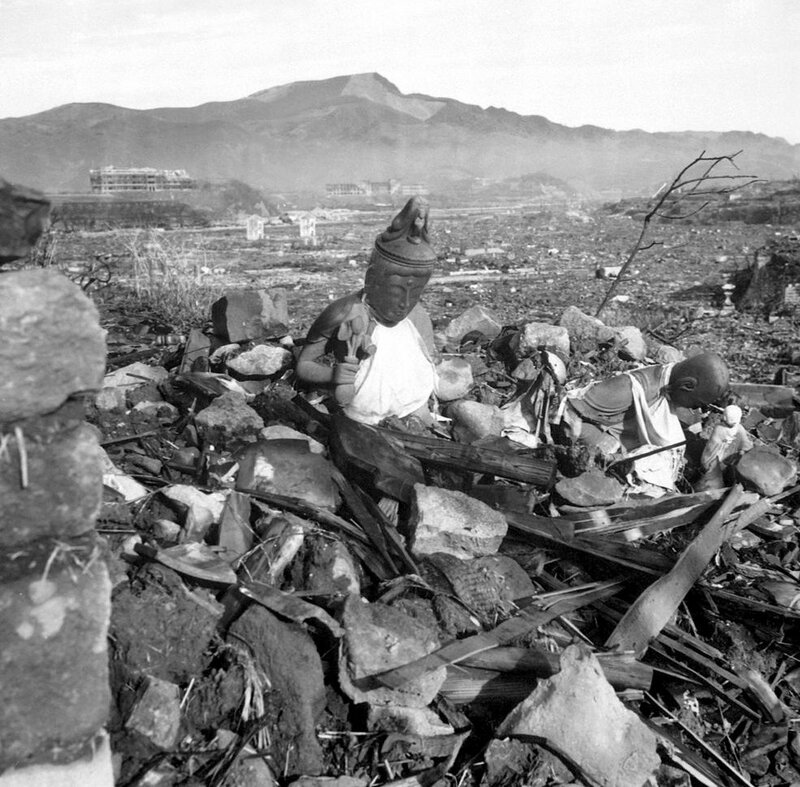 What is the legacy of the bombings in Nagasaki today? Taue: The atomic bomb survivors in Hiroshima and Nagasaki are still suffering from the aftereffects, and this is a negative legacy for Hiroshima and Nagasaki. However, nuclear weapons were made by humans, and humans can conquer, can abolish nuclear weapons. I would like to make this legacy a positive one, and that is what we are continuing to do. ACT: In the weeks and months and years that follow the commemorations of the bombings, what should be done to ensure that the experience and lessons of August 1945 are passed on to future generations in Japan and around the world? Taue: The most important thing is to know the facts, what the use of nuclear weapons will bring about to human beings. To know the facts is important because what we see around the world is that there are still many people who do not know about the atomic bombings. So, I think it is important for the people to know about the atomic bombing of Hiroshima and Nagasaki. In the United States, there is a widespread belief that the use of nuclear weapons was justified, that it was the right thing to do to use atomic weapons to end the war. Even if that were true, there’s a question if the United States really needed to use the second atomic bomb in Japan. So, I think the people should not be influenced by preconceptions and should first learn the facts. We would like them to think if the use of nuclear weapons to end a war is the right thing to do so that we can prevent the third use of nuclear weapons. The third thing I would like to say is that the appeal made by the atomic bomb survivors is not a message as the victims of the atomic bomb. They are conveying a message as members of the human race. They are trying to send out the message not as victims, but as human beings, on what the use of nuclear weapons will bring about to all human beings. ACT: Thank you very much, Mr. Mayor. We very much appreciate it. 1. Tomihisa Taue, Speech on behalf of Mayors for Peace, 2015 Nuclear Non-Proliferation Treaty Review Conference NGO Session, New York, May 1, 2015, http://www.un.org/en/conf/npt/2015/statements/pdf/individual_10.pdf. 2. In addition to Japan, the members of the Non-Proliferation and Disarmament Initiative are Australia, Canada, Chile, Germany, Mexico, the Netherlands, Nigeria, the Philippines, Poland, Turkey, and the United Arab Emirates. 3. Satoshi Hirose et al., “Proposal: A Comprehensive Approach to a Northeast Asia Nuclear Weapon-Free Zone,” Research Center for Nuclear Weapons Abolition, Nagasaki University, March 2015, http://www.recna.nagasaki-u.ac.jp/recna/bd/files/Proposal_E.pdf.